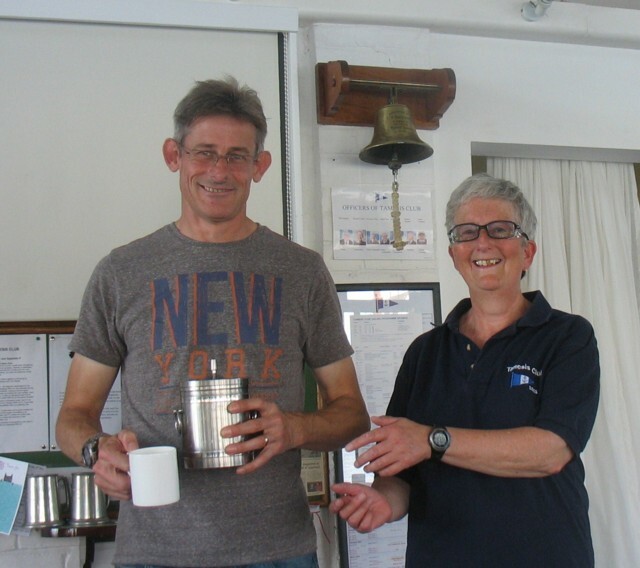 The British Moth Bucket was won by Toby Cooper from Broxbourne SC sailing To Moth (887) in a seven boat fleet at Tamesis on Sunday 7 September. The races were sailed in a very light northerly wind which gave a beat downstream and an upstream run, changing to an occasional reach in some places where there was a blow back from buildings and trees on the Surrey bank. Cooper won the first and second races of the three race event and all the other competitors decided to retire rather than struggle through a windless final race. Race Officer Jon Redding set a special course, with a dogleg opposite the Clubhouse, to give the visiting Moths an area largely unimpeded by the Club’s normal racing.